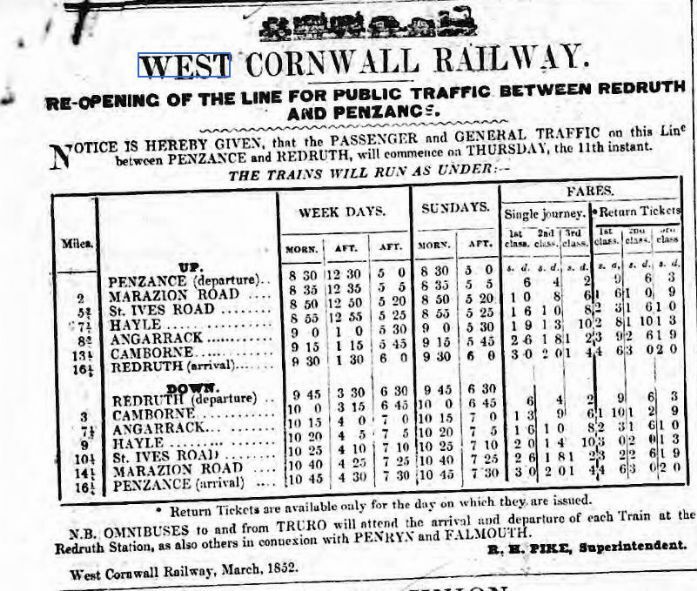 On 11th March 1852 trains began to run between Penzance and Redruth on the West Cornwall Railway. The line followed the course of the Hayle Railway of 1837 which ran from Hayle to Redruth but the old line's rope worked inclines were replaced by viaducts at Angarrack and Penponds. Brunel was the consulting engineer and, despite the widespread use of his broad gauge in the west country, Brunel built to the standard rather than the broad gauge. It was a future intention to extend from Redruth to Truro (Newham) and this was done in due course with the link to Truro being opened on 16 April 1855. The Hayle Railway had a branch from Pool to Portreath and another from Redruth to Tresevean. Both lines contained inclines using stationary engines and both were retained by the West Cornwall Railway.